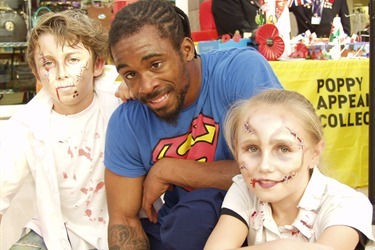 The Forum celebrated Halloween with a final round of special activities to entertain children. All week long children and adults alike had the opportunity to get involved in a range of activities from Mummy Making Workshops to talks from former Time Team conservator Dana Goodburn-Brown. Yesterday we paid a quick visit to the Forum where we found 6 year old Esme West midway through her transformation into a ghoulish character curtesy of Laura Bullard of Cherry Drop Face Painting. We also found an entire group of children busy making ‘Day of the Dead’ badges inside of CSI: Sittingbourne who also held a Safe Trick or Treating game where children were invited to hunt for posters around the centre in return for a free treat! The YAK Dance crew were also on hand performing to spooky hits such as ‘Thriller’ by Michael Jackson. Having fun were B-boy NRG, Teflon and b-girl Web who was very keen to do the last photo.